Can we just talk for once? I had only just sat down to write about the terrorist attacks in Ankara and Istanbul, and was still attempting to fully comprehend the damage inflicted by those attacks, when I found myself watching news reports of the attacks in Brussels. The attack in Ankara was carried out by two left-wing militants connected with the Kurdistan Workers’ Party (PKK). A group called Kurdistan Freedom Falcons (TAK)claimed responsibility for the attacks; indeed it was established by the PKK for the express purpose of claiming responsibility for these types of incidents. The bomb was detonated among civilians waiting to board buses at the busiest bus stop in Ankara, one used by poor and middle-class citizens, and left 36 dead and more than 100 injured. Because the attack took place on the day that university entrance exams were being held, there were more students and young people at the bus stop. This attack was similar to the one that had taken place a month earlier, also in Ankara, resulting in the deaths of 30 people and injuring almost 100. The perpetrators were PKK militants trained in the Democratic Union Party (PYD) camps in Syria. The attack in Istanbul, on the other hand, was also a suicide bomber, but this time ISIL was responsible. Five people – including three Israelis and one Iranian – were killed in that attack, but the incident apparently made a greater impression on the international community. This was due in large part to the fact that three of the dead were Israelis and because the attacker was a member of ISIL. We do not yet know the full details of the attack in Brussels, but initial info rmation indicates that ISIL has claimed responsibility, and that the individuals involved were members of ISIL. What all of these attacks have in common is the desire to terrorise and paralyse civilian life and the daily routines of ordinary citizens, to sacrifice without hesitation or compunction the lives of people who have taken no side in any conflict. There comes a point at which it no longer matters who claimed responsibility or perpetrated these attacks because they all begin to look alike and have the same effect. 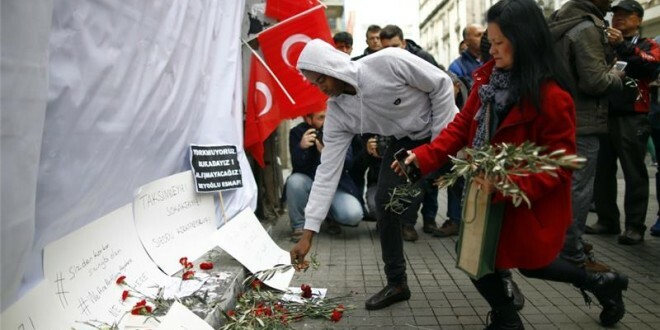 The attacks carried out in the middle of large cities such as Paris, Ankara, Istanbul and Brussels are a manifestation of violence in its most extreme forms, and for a time they paralyse city life. The result is that people feel vulnerable and are afraid to go to crowded places or take public transportation. Although life does eventually return to normal, these attacks carried out one after another have a major negative effect on the trust that people in the city have in their fellow man. Public confidence is one of society’s most important social assets and terrorism erodes it significantly. The methods used in all of these terrorist attacks are actually the same. The bombs may be detonated at different locations by different terrorist groups, but the results are the same. Innocent people die; their lives are snuffed out or they are injured with a blow struck just at the moment when they feel the safest. Although the results are the same, the world’s attitude towards these tragedies unfortunately varies depending on where the bombs exploded and on who detonated them. After the attacks on Charlie Hebdo and the Paris attacks, the entire world expressed its sympathy for the Paris victims and leaders from around the world joined in mourning. A narrative and an emotional reaction have developed to the diabolical acts of the ISIL terrorist group that perpetrated the violence. We see the same thing happening in Brussels. Even in the United States, flags were flown at half-mast and mourning was declared. Everyone became a Belgian. But when the same bombs are detonated in Ankara and Istanbul, the reaction is not the same. Does the fact that we do not see the same outpouring of sympathy for Ankara mean quite simply that the deaths are deemed more fitting for Ankara and Istanbul? This biased approach is identical to the perspective that dares to propose that refugees be kept within the borders of Turkey. Apparently, the refugees that are deemed fitting for Istanbul and Ankara are deemed unworthy of Europe. And we are not even referring to the incredible nonchalance displayed in the West when it comes to bombs being detonated by terrorist organisations in Baghdad or other regions of the Middle East. It is a pity that terrorism is not universally opposed simply because it is terror and because it is a crime against humanity. Not all terrorism is treated equally. Some terrorist acts cause no great consternation because they are viewed as functional by some. In Turkish cities every day, the PKK carries out attacks similar to what happened in Brussels, and yet we see that they are still viewed in European capitals as an innocent movement fighting for their freedom. Europeans are very nonchalant towards PKK terrorism, even though the approach, the philosophy and the results are the same. This is the reason that they openly support the PYD, which is just an extension of the PKK. The US insists that it will continue its support in spite of the PKK’s increasing violent and fatal acts of terrorism. These are statements released to the press while relating the heroic efforts of the PYD in the fight against ISIL. If a terrorist organisation can be turned into a charming group and exonerated because it is fighting against ISIL, then can we also assume that ISIL could become a legitimate and charming group if, in the future, it fights against a terrorist group even more savage and ruthless than itself? This inconsistent approach to terrorist organisations is unfortunately not a marginal view, nor is it the exception. We have become accustomed to hearing statements like this from both US and European officials every day, which makes us feel like the war on terror is a bit disingenuous, if not downright hypocritical. Are we fighting terrorism or just certain terrorists? This is the unanswered question we ask ourselves. Almost no one doubts that the PYD is an extension of Bashar al-Assad. It was appointed by Assad and armed with heavy weapons to protect designated areas on his behalf. The ethnic cleansing that it has practised from the beginning, particularly against other Kurdish communities as well as the Arabs and Turkmen in the region, make it no different from ISIL in terms of approach. But all of its crimes against humanity are forgiven, and the justification is that it “fights well” against ISIL. It has literally been authorised to engage in terrorism. All of the rhetoric about the war on terror is made suspect by the authority the PYD has been granted. Turkey is a country that has been plagued by terrorism for 35 years, a country that has made great sacrifices in the war on terror. This experience has taught Turkey some important lessons. Countries now dealing with the problem of terrorism have a lot to learn from Turkey’s experience. But the first thing they have to learn is to stop making a distinction between terrorism and terrorists. Today those who incite people to acts of terror and use the residents of the city’s historic district as human shields instead of seeking political solutions in Diyarbakir’s extremely open political arena unfortunately receive significant support from European politicians. The European parliamentarians who visit Diyarbakir, escorted by those inciting the terrorism, convey the terrorists’ perspectives to their people back home, but they neglect to ask the terrorists this hard-hitting question: Why are you digging trenches in this city? What contract have you made with your constituents which allows you to use them as human shields when attacking security forces and to turn the neighbourhoods of the people who voted for you into war zones? The security forces, which have gone to great lengths ever since the beginning of the conflict to prevent civilian casualties, have suffered around 250 casualties. And yet members of the mainly Kurdish Peoples’ Democratic Party (HDP) – which essentially acts as a political representative of the PKK – have the gall to engage in propaganda and accuse the state of committing atrocities against the people, and what’s worse, there is a significant market for this ridiculous propaganda in Western political circles and the media. People who buy this nonsense do not even stop to ask themselves why it is that civilians suffering from government operations have been able to kill up to 250 soldiers and policemen. The bias that is exhibited with regard to terrorism is even more dangerous than terrorism itself because the measures necessary to address the plague of terrorism cannot be taken as long as this bias exists.